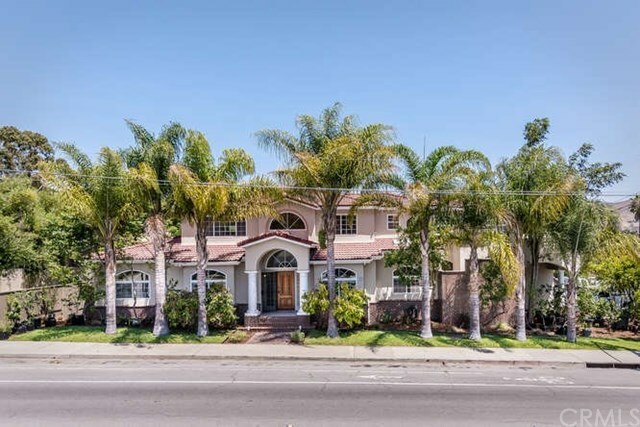 ANOTHER PRICE REDUCTION: Elegant palms line entrance to this 7 bedroom, 7 bath 4,932-square foot Spanish-style single-family home, including a legal one-bedroom maidâs quarters with kitchen and separate entrance. Great as a rental. Ten-person hot tub and decking next to family room. New carpet, built-in oak cabinetry and flooring just refinished. Newly painted inside and out. Kitchen is mostly remodeled, with Corian-like countertops (hygienic, maintenance-free HI-MACS) and Sub-Zero fridge. Huge basement with study areas, bar, offices and utility rooms. Wired throughout for your own internet server, and intercom with music in most rooms. Double-pane windows and new heater/air conditioner. Fire sprinklers in every room, several sump-pumps, and a backup generator in case of city power outage. Extra-large garage and bicycle-close to Cal Poly. Seller is a Realtor. Must be bought as owner-occupied according to city UNLESS small kitchen, stove, and refrigerator in second unit is removed. Owners are will to remove it. Directions: Corner of Patricia Drive and Foothill Blvd.